My apologies to my long-term subscribers who got a plethora of “new post” emails with really old posts – my old system, which had been deactivated ages ago, suddenly kicked in – but it’s been shut down again. Hoping it stays that way. I’m working on something you’ll LOVE – which was why the system went haywire. Can’t wait to share it with you! 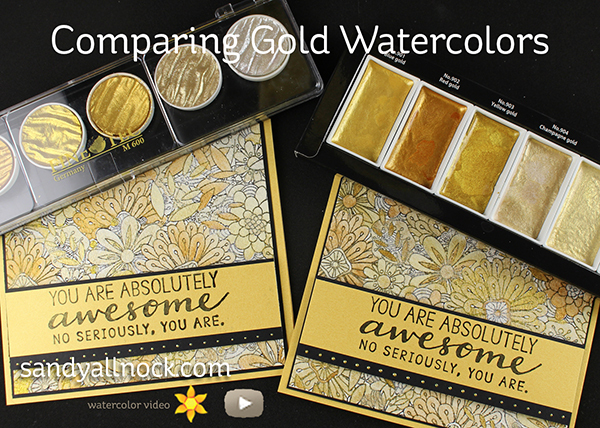 Once in a while, I have time to do some comparing of products….and these two sets of watercolors finally bubbled up on my list. Enjoy! The Finetec watercolors have been out for years now – but in some cases they’ve been hard to find. This year at CHA, Kuretake had some gold watercolors out, and it took me a few months to get around to buying them. Okay okay, it was have a year. LOL. (I do tell ya, I’m not all about being “first” with much!) Watch the video below or click HERE to see it in HD on YouTube. 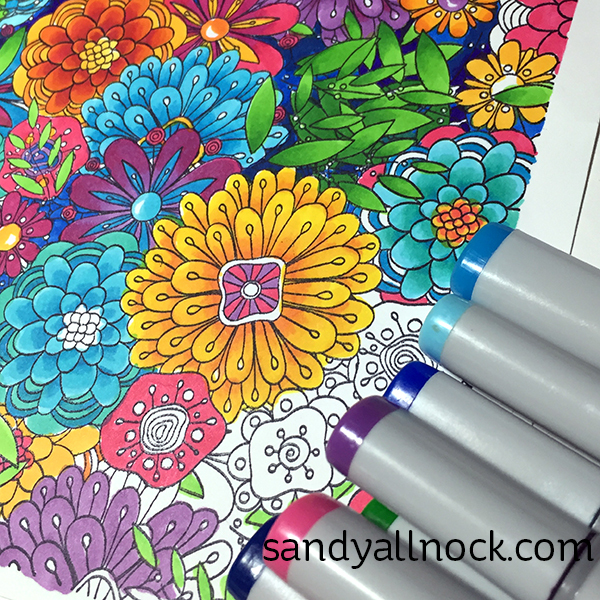 Lest you wonder what this background stamp looks like with Copics….yum! Daniel Smith Watercolor Grounds, Mars Black 4 oz. Oh, thank you, thank you, thank you! Just yesterday I was wondering how these two sets compared. Your cards turned out awesome. Thank you so much for this comparison! It was very helpful. Thanks for the comparison video. Very useful information. It helped me decide which set to get. Wow! How long did the Copic version take?! All those colors and shading! Love them all. Thank You for a great video. I do have one question do they both reactivate with water or are they permanent? Thank again. Great comparison! Thank you for doing this! I know it must have taken hours, even though it was a labour of love – but thank you! I have been wondering how they compare. I love how you cards turned out – absolutely stunning! I love the comparison and the great way to show off a background stamp. Don’t worry about the emails… I loved revisiting and thought you were playing some of your greatest hits. I have that MFT stamp sitting in my pile waiting to be stamped and colored and it’s working its way to the top. Nice to see an alternate use for it! Thanks for the comparison. These things take a lot of time to do, and you should know that we appreciate the info you provide! There’s quite a difference in price on these two, so it’s really comforting to see how close they are in quality. I’ve been happy with the metallic pans provided with the large Kuretake watercolor set that I got for Christmas last year, so probably won’t opt for more golds at this time – but now I know what’s what if I suddenly need to go for ALL the gold!